The siege of Villingen in July 1704 is part of the French reaction to Marlborough's march to the Danube, not of their original strategy for the 1704 campaign. France and Bavaria had ended the previous campaign with the capture of Landau, Alt-Breisach, Augsburg and Regensburg, conquests that would aid the communications between these allies. Their strategic position had furthermore been strengthened by the Hungarian rebels, who held most of Hungary by the end of 1703. In order to ensure that Max Emanuel held the upper hand in Bavaria some reinforcements were needed. The job to get these to him was assigned to Field Marshal Tallard. By good maneuvring Tallard succeeded in reaching the surroundings of Villingen from the west, while Max Emanuel came from the east by outmaneuvring Margrave Louis of Baden. On the 19th and 20th of May Tallard handed over 10,000 recruits and money to Max Emanuel and returned to the Rhine. On the first day of this success, this French strategy was however toppled by Marlborough starting his march to the Danube. The news that Marlborough was marching up the Rhine with 40,000 men made the original French strategy irrelevant. Villeroy was following Marlborough on a parallel course, but Versailles had a peculiar strategic problem: Marlborough was marching along the Rhine. This meant that Marlborough could march into Bavaria, Alsace, up the Moselle or, very frightening, load his army on boats and be back in Flanders long before Villeroy could. The French therefore decided first to see where Marlborough would go before they would initiate actions to counter the situation. The final direction of Marlborough's march became clear on 7 June when, near Philipburg, he turned his army east to Sinzheim. Louis had ordered his marshals Villeroy and Tallard, who were conferring that very day at Zweibrücken, to come up with a plan to counter a possible allied offensive against Bavaria. The marshals, sensing that disaster lay ahead, were of course not so foolish as to take responsibility by giving a decided advice that could later be turned against them. So they sent four alternative plans to Louis XIV, all with their own serious obstacles to success. The real message perhaps lay in Tallard's remark that helping Bavaria seemed impossible, i.e. Do not send anymore troops to Bavaria! I do not doubt that this was the most sensible advice, but also that the marshals knew that this was not the message Louis wanted to hear. Louis preferred the most daring plan. This included crossing the Rhine below Stollhofen and marching down the Neckar to Stuttgart. He thus wrote to his marshals for their thoughts, and they replied that they could not take responsibility for it. Louis then decided the matter by giving orders to Villeroy on 23 June. The French Rhine army was to be split as follows: Tallard would cross into Bavaria with 40 Battalions and 50 Squadrons. Villeroy would march in support to Offenburg with at least 40 Battalions and 68 Squadrons, and General De Coigny would cover Alsace with at least 10 Battalions and 10 Squadrons. The marshals now had orders with which they were not at all happy, as Tallard pointed out to Louis, stating he lacked enough cavalry to sustain himself. Tallard's march was preceeded by a maneuver by Villeroy, who marched to Offenburg in order to cover his march. Tallard then started to cross the Rhine on 29 June. On 2 July his army was probably still near Kehl2. Next he marched to Offenburg and then moved south to Hofweier, Herbolzheim and Emmendingen where he got 40 light and 5 heavy guns from Breisach. On 8 July Tallard camped at Waldkirch and by then he had news of the Schellenberg battle3. On 9 July Tallard continued at Waldkirch in order to let his infantry rest and to await his supplies4. Tallard then moved to Elzach and Prechtal on 10 July. There he had to take the first pass across the Black forest. In this operation 1,200 pioneers were used to prepare the roads, and the guns had to broken down and hoisted up and down. Tallard had some doubts about the fortified post the empire held at Hornberg. However, when Tallard's advance guard reached Hornberg on 11 July this was found to be abandoned. 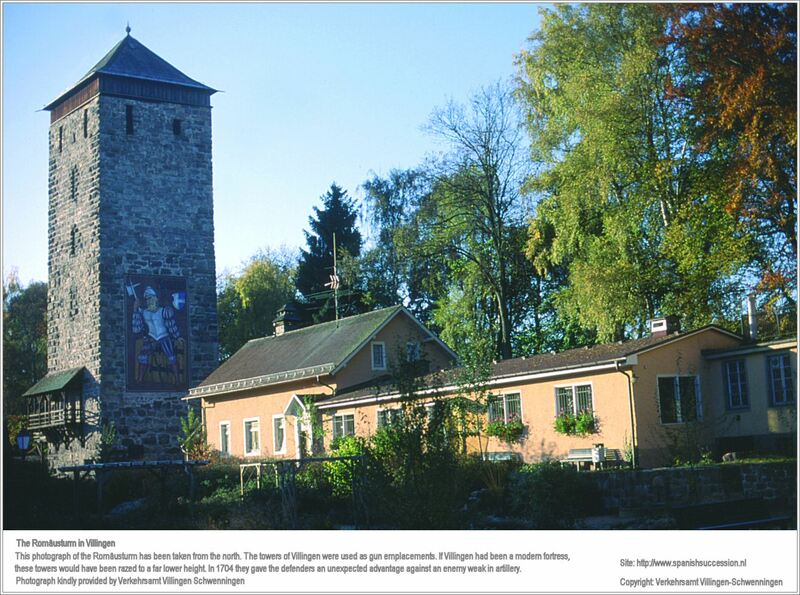 Having arrived at Hornberg Tallard Tallard established communications with Villeroy's army which was near Offenburg. On 12 July Tallard wrote to Chamillart from the Hornberg heights. In this letter he communicated that he had originally planned to take Rottweil first and Villingen later. He added that because of the events on the Schellenberg he had decided to take Villingen first5. (On 15 July he would however communicate his original plan again.) Tallard next took the road along the Windkapf (924 m), which was the only possible road further east. It led to Villingen or to Hardt and further on Rottweil. Tallard thus took it, but even though his advance guard made steady progress and soon arrived in Hardt, a good part of his main force and supply train where still in Hornberg when events put even more pressure on his plans. On 15 July Tallard wrote to the king that he had crossed the mountains, that two-thirds of his supply train had crossed the mountains, but that he had not received any news of Max Emanuel. In this letter from Hardt he also stated that he planned to be before Rottweil on the 17th and to take this place and afterwards Villingen. He would however continue one more day on the Hardt in order to await some supplies6. On 16 July 1704 Tallard was thus still camped on the Hardt plateau. Here he first wrote a letter to Chamillart stating that he had still not received any new from Max Emanuel. Later that day Tallard did receive a message from Marsin stating that Max Emanuel would probably desert if he did not soon receive news of Tallard's arrival7. 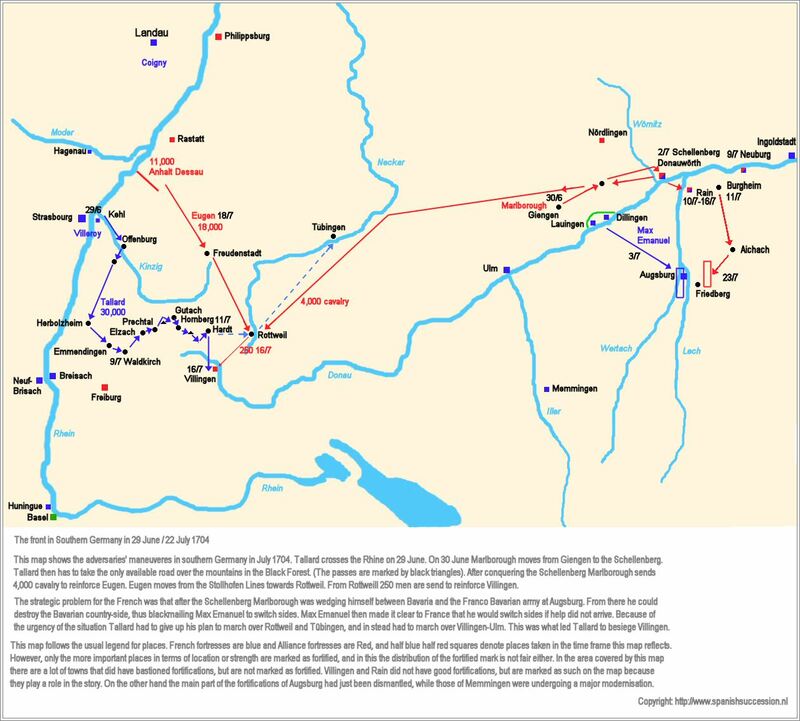 For Tallard this meant that he finally gave up his original plan to take the road over Rottweil - Tübingen. It would take too long and marching over Villingen had become the only alternative. In a letter to the king Tallard therefore reiterated that he had planned to take Rottweil first, but that this would now take too long. The fact that 300,000 rations of bread were rotten did however force him to spend two more days in order to prepare his march. Tallard therefore communicated that he would use this delay to take Villingen in the mean time and that he had started to execute this siege. This was a sound decision. Villingen was a rather weak fortress which could not be expected to hold out more than a few days. Because the French were anyway forced to wait for their supply train and had to take some time to bake bread this siege could not be expected to cause much extra delay. The added advantage of taking the town was that it could not only serve as a hub in Tallard's communication, but would also protect his supply line and facilitate communication by messages. The title 'Reichsfestung' would lead one to believe that the Empire had invested in the fortification and garrisoning of Villingen. This was not the case. While every serious fortress in Europe at this time had earth or earth-filled bastions that could take a lot of shots before being destroyed, the fortifications of Villingen dated from late medieval times. (Only one small modern bastion, the Bugeleisen, had been built recently). The design of Villingen's fortifications was of a type that first came up when the strength of cannon fire became to much for traditional city walls. 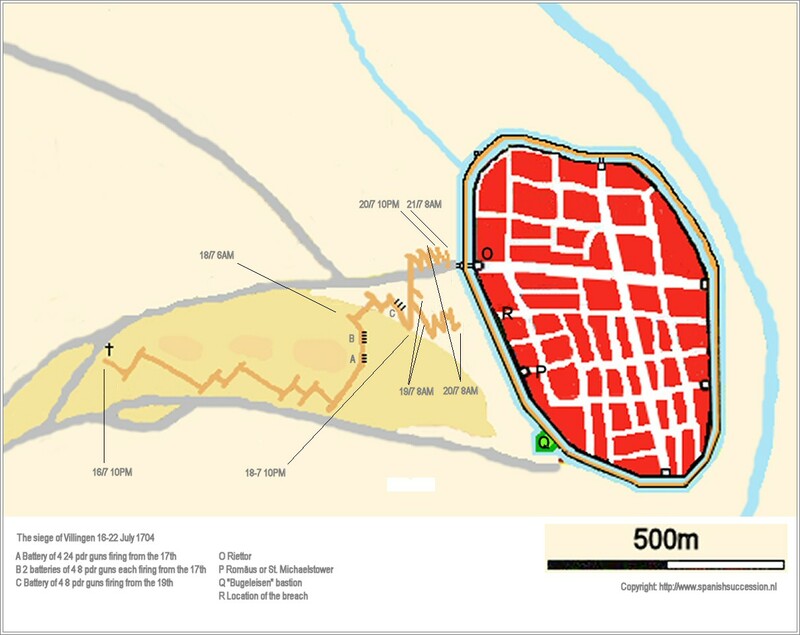 Primarily it consisted of a second lower wall constructed before the old truly medieval city walls. This second wall consisted of two walls about 5 meters apart and filled up with earth. Before and behind this second wall were ditches, and in order to protect them from assault there were low towers with very thick walls from which defenders could shoot along the wall at assault parties. (Though this would probably not function that well with Villingen's walls built in an almost perfect circle.) 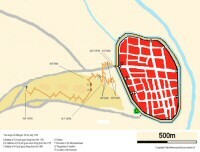 To complete this defence there were about four high towers in the old city walls from which tops cannon could be fired. The regular garrison consisted of 200 soldiers and had recently been reinforced with 250 new arrivals. These were aided by 500 militia (350 citizens and 150 countrymen), making for a total of about 950 defenders. Apart from their personal weapons these could use about 50 guns of different types and probably usability. In the morning of 16 July Tallard ordered General Marquis d'Hautefort with 10,000 men to march ahead and start the siege of Villingen. D'Hautefort did not waste any time getting the siege underway. He marched to Villingen where he made a camp on the Engelhardt (a terrain about 1 kilometre west of the cross on the map), and started digging a trench the very evening of the day he received the order. There was almost no delay in his attack as he succeeded in having the guns (four 24 pdrs. and eight 8 pdrs.) brought forward that very night. At 8:00 AM in the morning of 17 July the French batteries opened fire. The first battery consisted of four 24 pdrs which had to shoot a breach in the wall somewhat south of the Rietturm. The second and third battery totalled 8 field guns and had orders to silence the Rietturm and Romäusturm. The 'heavy' battery soon succeeded in doing heavy damage to the walls and the Franciscan monastery they fired at. The defenders reacted by trying to repair them with all kinds of material. Meanwhile the ditch was further advanced toward the wall and preparations were made for a second artillery position. That same day the rest of Tallard's army also came in, and camped on the Engelhardt. Breach shooting made still more progress on this day and succeeded in completely destroying the Franciscan convent. At a general level however, the defenders had the advantage in the artillery duel. The French lost 3 artillery officers, 12 gunners and some soldiers on this day. The trenches proceeded steadily this day and almost reached the point from where the final zig zagging lines would be dug to the walls. Up till daybreak on the 19th the French had been digging to reach the place where they wanted to make a breach. At the end of this day the breach in the first and second wall in front of the ditches was about 20 meters wide. The guns mounted on the Riettor did however succeed in causing high losses and in causing much delay to the trenches, on which they gave flanking fire. Therefore the French started an additional ditch leading to the gate in the Riettor and in order to facilitate this they mounted a forward battery to fire on it9. On 19 July Tallard vented his frustration about the siege in a letter to Chamillart, stating that the town enraged him10. According to this letter it would be necessary to dig on for two more days (nights). There was already a breach, but the trenches were still at a distance of 50 'têtes' from the ditch, and a final paralel had not yet been established. According to the science of siege warfare the wide breach in the walls meant that the French had an opportunity to perform an assault on the next day. The fact that in order to do this the troops had to cross a stretch of open terrain meant that this would lead to relatively heavy losses. Tallard's statement that the trenches were still too far from the breach is not at odds with this, but should be taken to mean that he wanted to wait for the trenches to advance somewhat more. According to the rules of siege warfare the besiegers could however reveal their intention to perform an assault in the morning. The defenders then had the option not to await this and to conclude an honorable capitulation. Therefore 3,000 Dragoons with fascines came up in the afternoon in order to be able to fill up the moat. Colonel von Willstorf probably thought that the French would not dare to assault the next morning or that he could make enough repairs to the breach in order to have a good chance to withstand it. He stated: "The brave citizens and soldiers confidently await the assault of the enemies, trusting on god and those in heaven." One more day of bombardment would significantly widen the breach and allow the trenches to fully reach the walls. Tallard's losses in a general assault would surely be lower with complete approaches. So, why not dig and bombard for one more day and storm on the 21st? Most important: one more day of work opened up the prospect of not having to storm at all. Tallard would spend the 20th trying to convince Colonel von Wilstorff to give up. He of course continued the bombardment, and during the night he also started a bombardment with incendiaries, fired from mortars. The women and children forming the fire patrols of Villingen would however succeed in extinguishing most fires before any serious damage was done. The 20th was again a day that according to custom Imperial Colonel von Wilstorff had done his duty and could give up in expectation of a storm the next morning. He choose not to do so. Perhaps he calculated that Tallard's trenches would not reach much further during the night and that the prospects for an assault would not be much better on the 21st. He might also have had Eugen's order to defend Villingen to the last man in mind. Anyway, his gamble would pay off. Now a nasty thing happened to Tallard: In the evening of the 20th heavy rain fell on the siege works. This was an unlucky event for any besiegers lacking rubber boots, but in this case it was fatal. The final French approaches to the breach had already been hindered by a high ground water level, but the rain running downhill now flooded them in such a way that the soldiers had to leave them. This caused that in the night of 20 to 21 July the French were not able to make any progress towards the breach. They were able to make some progress on the trenches leading to the Riettor, but there was no breach in front of this approach. On the morning of the 21st the French had to conclude that restoring the trenches would cost them at least 5 days. Tallard now had no choice but to order the abandonment of the siege. In a letter to Marsin he stated that his chief engineer was at fault for directing the attack through a swamp12. Officially the siege ended on the 22nd at 6:00 AM, when 6 musket shots were heard from the trenches, announcing its end. The French acknowledged the death of 34-36 officers. Other sources state that deserters said their strength was diminished by about 1,000 men. I am not an expert in these things, but if we multiply the number of officers killed by ten we probably get near to the number of soldiers killed, that then being 300-400. Supposing the number of wounded to be about equal to the number killed we also get about 400 wounded. The number of sick can be deduced from the 30 or 72 wagons that some say returned to Strassbourg laden with the ill (perhaps caused by the rotten and therfore unavailable rations?). The total of French losses could therefore indeed have been about 1,000 men. Losses on the Imperial side were stated by the Franciscan brother Funck as amounting to 4 civilians, 1 country girl and 4 soldiers (others say 8) killed, and about 30 persons killed. For the Empire the victory meant that the successful resistance had blocked the way down the Neckar valley to Stuttgart, and had thus given Eugen more space to maneuver. For Tallard the failed siege meant that he would not have a line of communication with France. This was an unpleasant prospect should the French have to evacuate Bavaria. However, he was not in a strategically much worse position than he would have been in had he not initiated the siege at all. The time loss would also not prove problematic. Credit should go to Colonel Von Wilstorff. In a very disadvantageous position he had the courage to put up a stout defence, and the ability to organize it well. In fact he got applauded for his actions by the allied as well as the French side. Tallard is often blamed for not passing by Villingen and starting an unnecessary siege. I think this needs more careful examination: Primarily, the time lost in the siege of Villingen was minimal. Secondly there was sound reasoning behind the siege. It was indeed a constant topic in communications between Bavaria and Versailles and had been planned at least two times before. Thirdly the situation can be compared to Eugen taking 13 days to besiege three! places that can be compared to Villingen while he was on his way to Turin in 1706, and I know of no-one denouncing that. If however, Tallard had the chance to assault on the 20th he probably could be blamed for not doing so. This not because of the rain (that he could not have foreseen), but because the Villingen affair was set in a strategic environment that did not allow for a strategy to save lives, but in stead demanded a strategy to save time. (Try to imagine what Marlborough or Eugen would have done). However, if Villingen had surrendered on the 21st or been taken by storm on the 21st or 22nd, which would have probably come to pass without rain, there would probably have been no question at all of his conduct. Tallard was thus more unlucky then incompetent. Out of '300 Jahre: Marschall Tallard belagert Villingen' I have also transcribed the message from Tallard to Louis XIV, that can be found in: Siegfried Steinbrück: 'Marschall Tallard - Die Belagerung Vilingens im Jahr 1704 von der anderen Seite gesehen' published in GHV Jahresheft XXII, 1997/98, page 76. 3) Letter by Tallard to Chamillart on 8 July 1704 from a camp near Waldkirch. 4) Letter by Tallard to Chamillart on 9 July 1704 from a camp near Waldkirch. 5) Letter by Tallard to Chamillart on 12 July 1704 from a camp on the Hornberg heights. 6) Letter by Tallard to the king on 15 July 1704 from Hardt. 7) Letter by Marsin to Tallard on 12 July 1704 from Augsburg. 8) Letter by Tallard to the king on 18 July 1704 from Villingen. 9) Letter by De Freizeliere to Chamillart 21 July 1704 from Villingen.